If Satan Can't Steal Your Joy: He Can't Keep Your Goods! - Publisher The powerful truths in this book will help you find your joy and get you back on the track of being a victor instead of a victim. Satan wants your joy, and he wants it badly. Stop him in his tracks by learing how God's Word produces joy, how Satan steals your joy, how to laugh more and cry less, and much more. 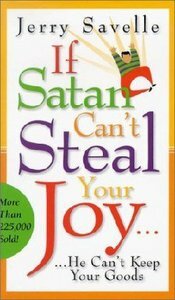 About "If Satan Can't Steal Your Joy: He Can't Keep Your Goods!" The powerful truths in this book will help you find your joy and get you back on the track of being a victor instead of a victim. Satan wants your joy, and he wants it badly. Stop him in his tracks by learing how God's Word produces joy, how Satan steals your joy, how to laugh more and cry less, and much more. Customer Reviews For "If Satan Can't Steal Your Joy: He Can't Keep Your Goods!" WOW, WOW, WOW! This book completely changed me life forever. I never realised how something so simple could be so important. Never again will I look at a "self-pity party" the same. I HIGHLY recommend this book to anyone who is fed up of the devil keeping your goods. This teaching has been one of the top messagesbooks that completely shaped my life. I started reading it years and years ago, and ever since then I go back to it constantly for a fresh revelation and reminder. It is a subject which is almost forgotten in our teachings now, yet depression, anxiety and a general lack of joy in life I believe are some of the greatest challenges Christians today are suffering from. This teaching taught me how I can not only stay joyful through times of troubles and hardship, but joy of the Lord is actually a vital key to seeing my breakthrough and victory. I hugely recommend this book and any other teachings by Dr Jerry Savelle - a MUST READ! !